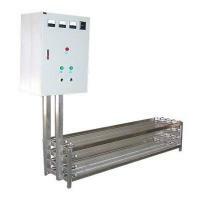 The KWE Open Channel UV Disinfection System uses energy-efficient amalgam lamps. These high output lamps are automatically dimmed when flow demand drops or when the water quality changes. The module is made by SS304/SS316corrosion resistant. UVC lamps and signal cables are in UV disinfection module and will not expose to sewerage or ultraviolet rays. Specially designed for hospital, laboratory, medical manufacturing process, wastewater reuse, agricultural water disinfection, swimming water disinfection, aquarium water disinfection, aquaculture water sterilization aquatic park water sterilization and oilfield re-injection water disinfection. Designed for small&low flow rate sewerage treatment and wastewater treatment such as hosipital, laborotary, medical manufacturing, chemical producing waste water. This highly flexible system has demonstrated its effective, reliable performance around the world. It features auto-cleaning system to minimize maintenance. It is well suited to wastewater & sewerage disinfection applications with a wide range of flow rates, as well as challenging effluent (primary and combined sewer overflows) and high level disinfection such as tertiary wastewater reclamation and reuse. The module is made by SS304/SS316—corrosion resistant. 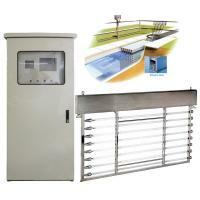 UVC lamps and signal cables are in UV disinfection module and will not expose to sewerage or ultraviolet rays. Specially designed for hosipital, laboratory, medical manufacturing processing wastewater disinfection. The adoption of ultraviolet light for wastewater disinfection has grown significantly over the past few decades. Today, many wastewater treatment plants in the worldwide employ this environmentally-friendly technology. Thousands of municipalities have converted from chemical-based disinfection, such as chlorine gas, to UV due to the significant safety advantages for their communities, plant employees and local water bodies. As new wastewater treatment plants are constructed around the world, UV is most often selected for disinfection because of the cost savings in both initial construction and long term operation. UV is the only cost-effective disinfection alternative that does not have the potential to create or release carcinogenic by-products into the environment. In addition, UV is an effective disinfectant for chlorine-resistant protozoa like Cryptosporidium and Giardia. While unregulated in wastewater, these harmful protozoa, if left untreated, can find their way into drinking water intakes located downstream of the wastewater treatment plant. UV disinfection systems have undergone field-testing and third-party witnessed bioassay validation testing to ensure the UV system will meet regulatory requirements. Our Auto-Cleansing System provides superior sleeve cleaning and reduces maintenance costs. Fouling and residue build-up on quartz sleeves reduces system efficiency. Auto-cleaning System maintains at least 95% transmittance, ensuring the high transmittance quartz sleeves are clean and the system is consistently delivering accurate dosing while reducing power consumption. Cleaning occurs automatically while the lamps are disinfecting. There’s no need to shut down the system, remove or bypass lamp modules for routine cleaning. KWET is a 10-years-experienced manufacturer of water treatment equipment Stainless Steel UV Sterilizers. In the past one decade of years, our products were well praised by above 110 customers in worldwide, because of the high quality, simple operation, reliable performance and low price. Each day, over 3000sets of our UV Sterilizers (or said Water UV Disinfection System) are running in thousands of projects, producing lines, plants, sewage plants, and families to keep water safe. Secondary & Tertiary Effluent UV Disinfection, Chlorine Conversion to UV Disinfection, Water Reuse with Ultraviolet Disinfection, Low Quality Water Ultraviolet Disinfection. Cryptosporidium Barrier, Giardia Barrier, Virus Barrier, Primary Disinfection, Multi-Barrier Strategy. Advanced Oxidation - Indirect Potable Reuse, Seasonal Taste & Odor Treatment, Contaminant Treatment, Groundwater Remediation. Meanwhile, we provide consummative products, electronic products trading service. Our target: provide well protection to every water source / reuse / treating processing.